Schooled as a city planner in the Midwest and the North of England, Dan Carmody is a devoted urbanist with special interest in regenerating depressed local economies. Educated as a tavern keeper, he understands the needs of independent business owners and the importance of conviviality in successful place making. Dan has been a downtown and community development practitioner for more than thirty years. Serving as a city planner, succeeding as a tavern keeper, and developing two different community development organizations into national models. Between 1988 and 2005 he led Renaissance Rock Island, a consortium of non-profit community and economic development groups that helped revive an Illinois community devastated by the mid-1980’s Rust Belt meltdown. Since 2007, Dan has led the Eastern Market Corporation a non-profit that is re-defining the role of public markets/food hubs in the development of regional food systems. 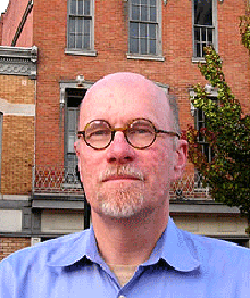 Since the mid-1990’s he has also served as a consultant to more than forty community development programs throughout North America, served on the board of directors of the International Downtown Association, and frequently presents at food, economic development, and place-making conferences. Dan is a visionary with street cred. Having witnessed the process of revitalization from many perspectives, he provides the kind of insight needed to recalibrate strategies to improve organizational effectiveness. Mike Jackson, FAIA, recently retired as the Manager of the Preservation Services Division of the Illinois Historic Preservation Agency (IHPA). He continues to serve as a visiting professor of architecture at the University of Illinois at Urbana-Champaign and is a deep-thinker about Main Streets and their connection to long term sustainability in a future constrained by resource availability. Mike holds degrees from the University of Illinois at Urbana-Champaign and Columbia University in New York. He is a founding member of the Association for Preservation Technology Committee on Sustainable Heritage and active in the development of green building standards and preservation policies. He has been active in the field of historic preservation throughout his career and has been a leader in the areas of Roadside Architecture, Main Street, the Recent Past and Sustainability.